When you delete an email or move it to another folder in your IMAP client, the email will be deleted or moved to another folder based on your IMAP settings. To make these changes immediately in your IMAP account, you can enable the 'Expunge Immediately' option with the steps below. 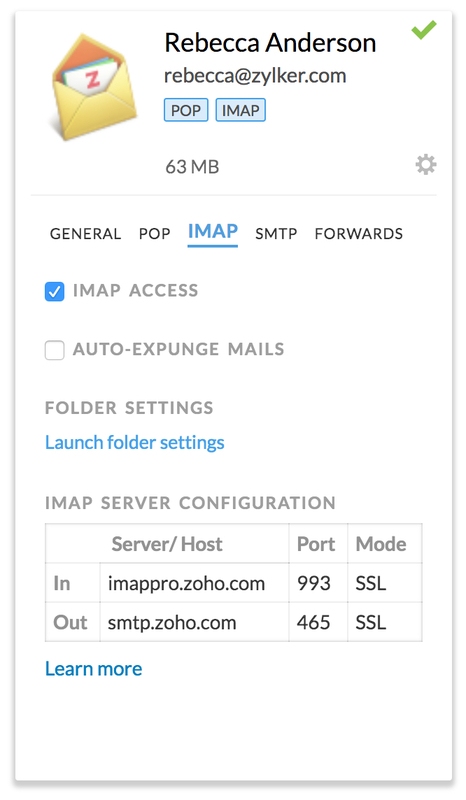 Check Auto-Expunge Mails - This will remove messages from the Zoho Mail server when you delete/ move emails in the IMAP client. Uncheck Auto-Expunge Mails - This option will not delete the emails unless they are manually expunged from the IMAP client. In case you are a Federated Sign In user (Using Sign in using Google Apps/ Gmail/ Facebook etc), then you might not have an exclusive password in Zoho for your email account. Refer here for detailed instruction to generate a Password for your account. You cannot 'Sign In' using your external account for POP/ IMAP/ Active Sync. You need to have IMAP Access enabled for your account, before configuring IMAP in the other email clients. Refer this section for instructions. For newly signed up users (Free plan), POP Access feature will not be available. Refer here for more details.